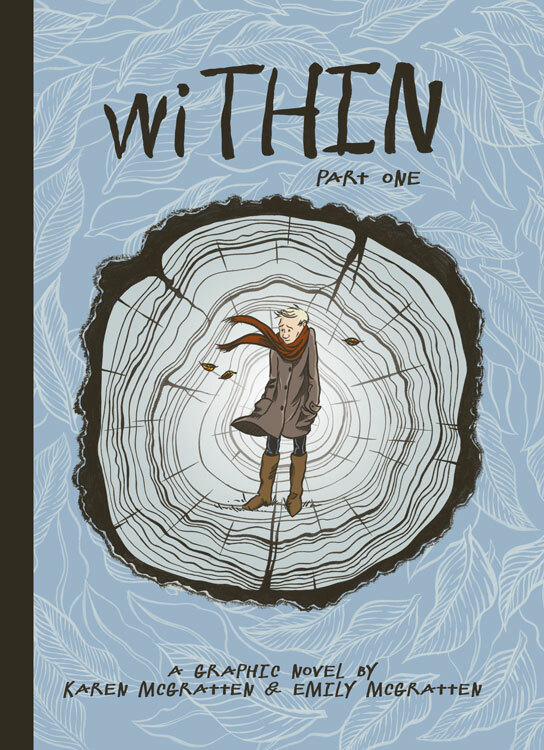 wiTHIN | wiTHIN is a graphic novel that takes the reader from pre-eating disorder to post-eating disorder and the journey that lay wiTHIN. Hi everyone! We’ve been getting lots of people asking when Part 2 is coming out. It is in illustrative works as we speak. We are hoping within the next year. In the meantime, we’ve been writing to publishers in an attempt to help get Part 2 and 3 out there quicker, as well as getting Part 1 into the hands of a wider audience. A lot of behind the scenes stuff. Thanks for your continued support and we will keep everyone posted! It’s true! We’ve recently switched printing agencies (now with TLAC) and have our 3rd printing of wiTHIN Part 1 available for purchase!! How exciting is this! We’ve also made some changes to this round of printing. We’ve included our ISBN, added quotes to the back of the book from various magazines and bloggers who have done a piece about wiTHIN and changed its size. Hey all, Emily here! This past weekend I was able to head on down to Vancouver for Canzine West and sell some of the new stuff I’ve been working on lately as well as feature wiTHIN. While there, I was delighted to receive a copy of the new Broken Pencil magazine and see an excerpt of wiTHIN splashed across two pages! It’s always encouraging to see the hard work Karen and I have put into this book recognized and we’re super thankful that people have been receiving our book so well. We’ll start updating you on how part two is coming along soon! I wondered by the Bookshelf in Guelph, ON earlier this month to scope out whether or not the May/June magazine publication of THIS was out. I had been making such trips, for weeks on end, in anticipation of the article featuring wiTHIN. Finally the day had arrived! I quickly picked up the magazine and flipped through its pages hoping to stumble across the article instantaneously, as if fate would direct me to its page. No such luck, so I immediately went to the index. I hurried to page 39, and there it was. It seems surreal to read about wiTHIN in an actual magazine, but what I am more curious is whether or not people will be drawn to it? I don’t mean this in a self-conscious way, but will people glance at it, see that it’s about mental health, and turn away in fright, uneasiness, disinterest or judgment. I’m okay with the judgment part. I’m continuing to learn how to accept that people will always judge, and that doest necessarily have anything to do with me! Not everyone will like this story or the message in it, but why the uneasiness or fear? I know the answer to this question. I had the exact same response or stereotype when it came to mental-illness (which is evident in Part 1 of wiTHIN). I held stereotypes about those who would self-harm or who heard voices in their head… until I got to know people with such issues on a personal level or evolved to one day struggle with the same issues. It is my hope that through reading wiTHIN, some of those stereotypes will be challenged and broken. That they will see a person amongst the behaviours and obsessions. I hope that people allow themselves to relate as opposed to feeling they must distance themselves from the main character. That they will take a chance and realize mental health is something to be afraid of only if it remains silenced. Look under the bed and you won’t find a monster. It is only the fear of the unknown that drives people away from one another in fear and hate. That is one of the reasons why I wrote wiTHIN. And I hope it is one of the reasons why you choose to read it. Be sure to check out your local shops for the May/June publication of THIS magazine! 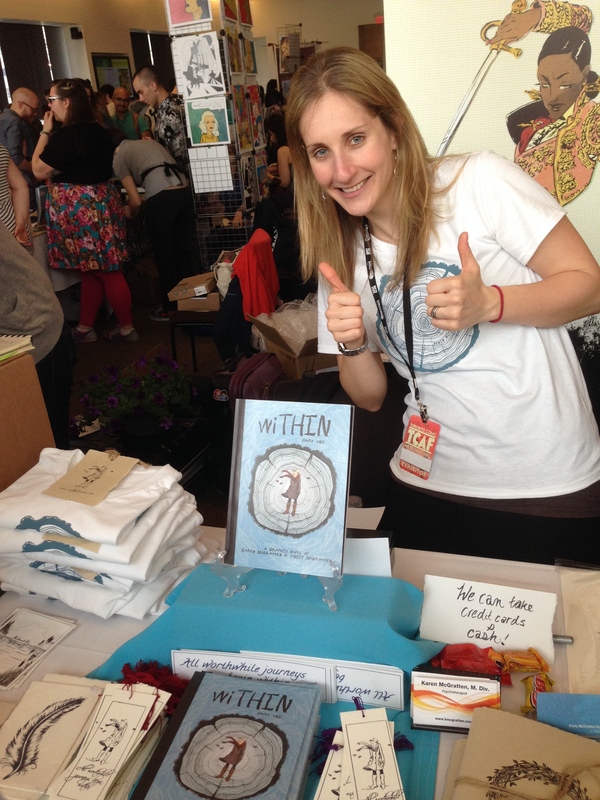 This past weekend I had the opportunity to take part in the adventure of TCAF as wiTHIN was debuting. I have gone in the past but up until this weekend, I have never been a vender showing off art and material. Not being an artist myself (I draw stick people!! ), but the author of wiTHIN, I found the whole experience to be quite fascinating. First of all, there were tons of people, both venders and attendees! Even though it was held at the Reference Library in Toronto, it was crowded. People who had came on the first day, returned on the second as they had not even reached the second floor of the exhibit. And of the people who attended, some were in costume, others with funky hair do’s and colours, cool tights and interesting tattoos. Old, young, even sleeping babies! People drove/flew across provinces and over the boarder to attend or participate in this event. The energy in the room was happy and fun, which made selling product quite enjoyable and entertaining. It was encouraging as it was the first time wiTHIN made such a public appearance since being available for purchase online. Through word of mouth and online marketing, individuals came specifically looking to buy the book. This was encouraging to both myself and Emily McGratten for a variety of reasons. For one thing, it is always an honour when people are interesting in buying pieces of art or material you have created, but secondly, that there was a shared passion in the message and purpose of what we were doing. Many people could either directly relate to the message of wiTHIN, knew of someone who had or is struggling, or felt this was a topic that needed to be talked about more in the open. What I also enjoyed about TCAF was the variety in art displayed as well as diversity in experience. From anime, to screen printing and well-known artists to first time vendors. There was room for us all, and all with a story of some sort to tell! Next up for wiTHIN is the Vancouver Comic Arts Festival on May 24-25th. Check it out! 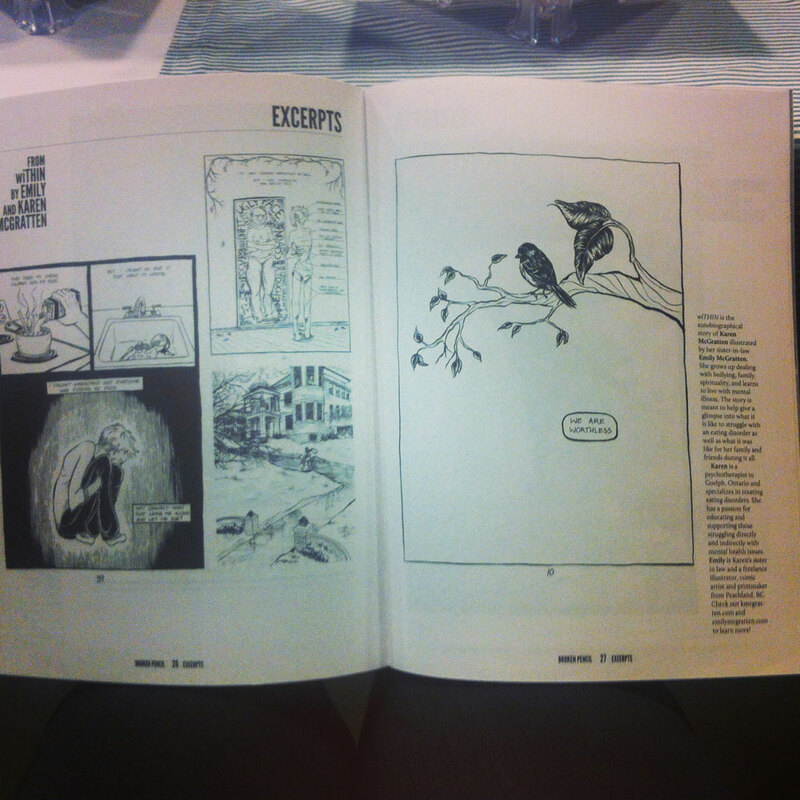 Evan Munday from Open Book Toronto did a interview with Karen and myself about wiTHIN debuting this weekend at TCAF in Toronto! Check it out here! I came across a journal yesterday that contained the first few pages of wiTHIN (well, it didn’t even have a title back then). 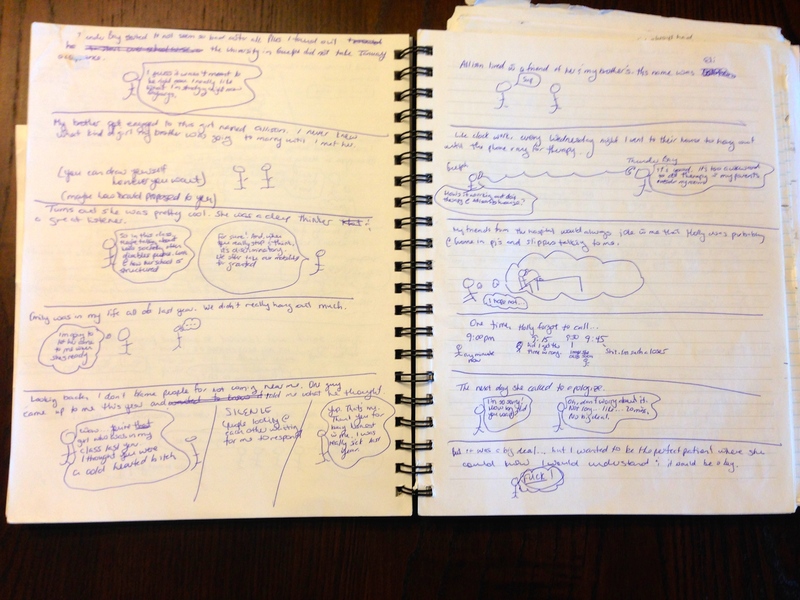 Back then, my writings contained stick figures and bubble words that I would then send off to Emily to illustrate. Obviously, this chaotic method of writing didn’t work, so I just focused my attention on writing while Emily would think of illustration. I thought it would be fun to show the readers just how far wiTHIN has come as well as how thankful I am that Emily is the one drawing our graphic novel instead of me!! I’m sure our readers are thankful for this too! 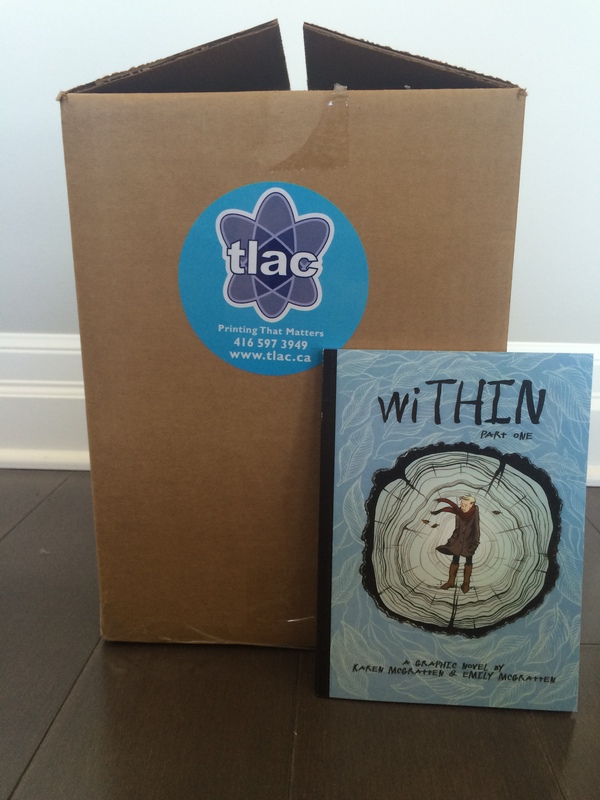 From stick people, to written form, to what you will soon have in your hands, wiTHIN has truly had its own journey! Hey everyone, our store is up and ready to take orders! 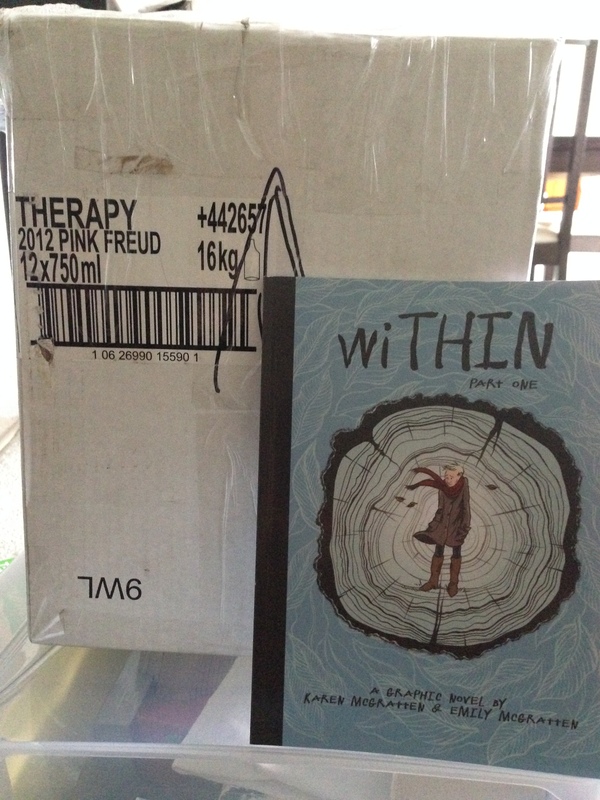 Just visit within.storenvy.com to buy your very own copy of wiTHIN. You can see all the other great swag that goes along with our book there as well. Hi everyone! Emily here. Sorry for the lack of posts lately. I’ve actually been living in a cave emerging only for some human contact and the occasional meal. But, good news! The book is ready for printing and all is well with the world! We’re totally on track to have this ready for you all to read by May (of THIS year) and we’re getting really excited about having this first part of wiTHIN nearly done. I thought you might all like to take a look at the shiny cover I designed as a little peek of what’s to come. If you missed out on the Kickstarter for our book, have no fear! We will soon have an online store where you can order your very own copy of wiTHIN and also some generally awesome swag as well. Stay tuned, we’ll let you know as soon as that’s up.